FRAME Collection comes from generating serene and timeless shapes using the framework as elementary geometry. The endless possibilities offered by the material using advanced technology, was the motivation to explore the limits. The FRAME section is flared creating pieces of visual lightness while still cathegorical and resistant. FRAME meets a wide range of needs in any outdoor space thanks to its variety of pieces. The collection consists of high and low stools, benches, chairs, modular sofa, tables of various sizes, chairs and chaiselongue. 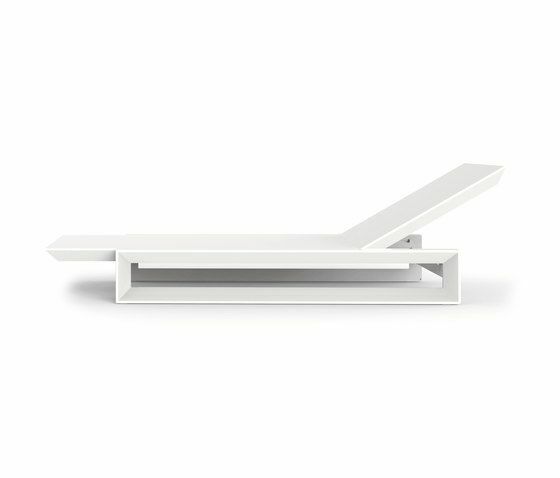 The lightness of the pieces such as the armchair and chair are stackable. The chaiselongue has a reclining backrest and wheels built in the framework for a better displacement.